Approximately 26 million pieces of checked luggage went astray on international flights in 2011, so ensure you label your travel baggage professionally so your journeys remain stress free by insisting on ProudGuy's TUFFTAAG! All listing text and photos: Copyright ProudGuy 2015. 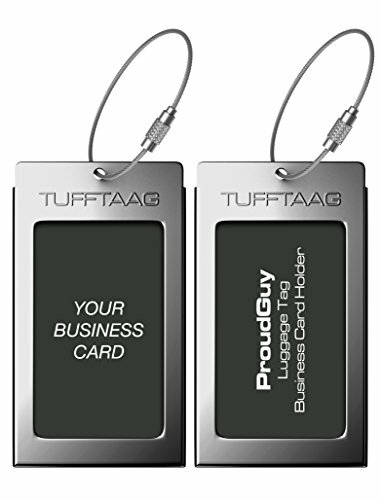 HIGH-QUALITY ALUMINUM LUGGAGE TAGS; ProudGuy TUFFTAAG Luggage Tags Business Card Holders are made of special grade reinforced aluminum to withstand the harsh conditions of extensive travel. Size: 2.36" x 4.13" x 0.15". You'll enjoy years of effortless use while looking stylish and professional wherever you land. STURDY STEEL CABLE SUITCASE TAGS; each tag comes with a thick cable that's made of sturdy steel to ensure that they stay properly secured to your luggage while you are traveling. PERSONALIZED ID BAGGAGE LABEL TAGS that will fit a standard sized business card. A printable PDF with name cards, initials, numbers and "not your bag" slogans is emailed with each purchase to customize and personalize your identity. Be aware that if your business card has text printed on the edge, it may be covered by the casing frame. If you wish to hide your identity simply flip your name card over. PERFECT GIFT IDEA; these stylish suitcase tags are perfect presents for Valentine's Day, weddings, birthdays, Mother's or Father's Day. Especially nice Xmas gift for that traveler in your life, or look stylish this season on your own holiday travels! Backed by a Year Guarantee. Click the Orange button to Order Yours Now! If you have any questions about this product by ProudGuy, contact us by completing and submitting the form below. If you are looking for a specif part number, please include it with your message.